The Ocean King English Version Game Board is a video redemption arcade game with a marine theme, located in Hong Kong, where players have to catch fish to earn points or credits. The Ocean King game board featues a range of engaging features for players of all ages and skill levels to enjoy! This Ocean King english version arcade game board is suitable for 6 player cabinets and is great for customers looking to recondition or upgrade their old fish hunting video game. It is also good for customers that need to replace their current Ocean King game board due to damage or faults. The game play is very simple and is easy for players of all ages to to understand. Players simply aim their gun at the various targets, once they have lined up a target they press the 'SHOOT' button to try and catch the fish. Players will receive points or credits for the fish they catch - the bigger fish are worth more points - and can change between three types of guns with different net sizes and power levels. When players have finished, they will receive their payout. There are 17 types of fish in this game. The fish include: Clown Fish; Flounder; Snapper; Lobster; Lantern Fish; Fugu; Devilfish; Shark; Lionfish; Spearfish; Saw Shark; Octopus; Butterfly Fish; Sea Turtle; Killer Whale; Humpback Whale; and Bomb Crab. The game also has three super fun mini game features for players to enjoy, including: - <b> Twister: </b> Each fish (except devilfish, shark, killer whales, humpback whales and bomb crabs) have a twister feature. When a player picks up the twister feature, the fish with the twister feature at the time captures all the same fish near it for the player. - <b> Chain Thunder: </b>There are nine types of fish which are subject to chain thunder: snapper, clown fish, butterfly fish, fugu, lionfish, flounder, lobster, spearfish and octopus. Use the chain thunder to get up to nine kinds of fish at once and win extra points depending on how many fish and how many types of fish are present on the screen at the time. - <b> Bomb Crab: </b> When the bomb crab is captured by a player it explodes and the player can get extra points from the explosion if it affects other fish. 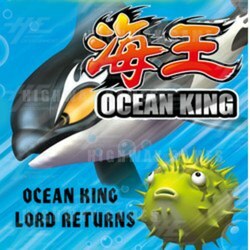 The Ocean King English Version Game Board is a video redemption arcade game with a marine theme, located in Hong Kong, where players have to catch fish to earn points or credits. The Ocean King game board featues a range of engaging features for players of all ages and skill levels to enjoy! This Ocean King english version arcade game board is suitable for 6 player cabinets and is great for customers looking to recondition or upgrade their old fish hunting video game. It is also good for customers that need to replace their current Ocean King game board due to damage or faults. The game play is very simple and is easy for players of all ages to to understand. Players simply aim their gun at the various targets, once they have lined up a target they press the 'SHOOT' button to try and catch the fish. Players will receive points or credits for the fish they catch - the bigger fish are worth more points - and can change between three types of guns with different net sizes and power levels. When players have finished, they will receive their payout. There are 17 types of fish in this game. The fish include: Clown Fish; Flounder; Snapper; Lobster; Lantern Fish; Fugu; Devilfish; Shark; Lionfish; Spearfish; Saw Shark; Octopus; Butterfly Fish; Sea Turtle; Killer Whale; Humpback Whale; and Bomb Crab. Twister: Each fish (except devilfish, shark, killer whales, humpback whales and bomb crabs) have a twister feature. When a player picks up the twister feature, the fish with the twister feature at the time captures all the same fish near it for the player. Chain Thunder: There are nine types of fish which are subject to chain thunder: snapper, clown fish, butterfly fish, fugu, lionfish, flounder, lobster, spearfish and octopus. Use the chain thunder to get up to nine kinds of fish at once and win extra points depending on how many fish and how many types of fish are present on the screen at the time. Bomb Crab: When the bomb crab is captured by a player it explodes and the player can get extra points from the explosion if it affects other fish.